When I first started looking for a topic for my doctoral dissertation, the history of Iranian masculinities was definitely not on the agenda. I was interested mostly in different aspects of consumer culture in Iran, and was examining different ways to tackle these issues. But one major obstacle kept me from delving any deeper into them – the lack of primary sources, or, more accurately, the lack of accessibility to such sources. Whereas the problem of accessing archives in Iran is felt by many researchers, being Israeli added another layer of complexity. I could not travel to Iran, and could not be in touch with any official elements in the country. After several months thus spent, my supervisor suggested that I will look for a new topic for my dissertation, one that would not necessitate the use of archives in Iran. This was the point in which masculinity came to my mind. My hope was that masculinity’s omnipresence in everyday life will make it ubiquitous in historical texts as well. Luckily, this hope was realized once I started going through Iranian newspapers, journals, literature, autobiographies, and visual sources. A new challenge quickly made itself clear. Masculinity, unlike femininity, is often ironically transparent, taken for granted, and hardly discussed as such. It is true that most writers, readers, reformers, and politicians during the period which I study (the late 19th and early 20th century) were men – but their gender has never been the focus of attention. Whereas the “woman question” had its fair share of journalistic and political writing, no parallel “man question” existed in Iranian texts from that period. Men were (and still are, often) seen as the norm, the natural state, and apparently their gender identity needed no discussion or problematizing on the behalf of Iranian modernizing reformers. This meant that I could not count on treatises, journal articles, or newspaper columns dedicated specifically to masculinity, but rather had to adopt a different method for collecting my materials. It became apparent that many texts that were not strictly about masculinity, were, in fact, deeply informed by notions and ideas of gender. The clearest examples of such texts were nationalist and revolutionary texts from the Constitutional Revolution period, which contain a heavily gendered language. This gendered language refers to women, but even more often to men and manly traits. The use of such a gendered language had a double effect: on the one hand, it was used to shame men into nationalist activity by suggesting that men who did not join in were less manly. On the other hand – it constructed patriotism and political action as masculine, thus contributing to the creation of a new ideal of masculinity, or of a new ‘hegemonic masculinity’, to use Raewyn Connell’s term. New subordinate masculinities also proved easy to find in Persian literature of that era. Many of the short stories and plays written during the early 20th century were satirical and educational in purpose – pointing at Iranian society’s ills as they saw them. Therefore, the characters in their works were often the object of ridicule, exaggeration, vilification, and scorn. These writers were constructing both subordinate masculinities, and, by way of contrast, a new model of hegemonic masculinity. One such subordinate type is the westernized dandy – the farangimaab or fokoli. By pointing to their readers how westernization should not look like, Iranian writers also suggested how it should be done. Whereas their dandies lacked true understanding of western culture, and merely aped western appearance and mannerism, informed westernization was presented as a patriotic way to reform Iran. Surprisingly, things became more difficult when I started going through some of the texts I believed would contain the richest and most detailed descriptions of men’s practices and experiences, including the perceptions of theirs and others’ masculinity – autobiographies and interviews from Harvard University’s Iranian Oral History Project. Most autobiographies and interviews are very thin on “personal” matters. Most of the text is dedicated to the author’s political, educational, or national activities, whereas information on his family life, love life, not to mention thoughts about gender and sexuality, receive little if any attention. This could be the result of genre conventions, of notion regarding what is “proper” to expose, or of the writers’ ideas about what their readers are looking for in the book, but the result is the same. However, some autobiographies did contain short descriptions of childhood experiences, of relationships with parents, and most of them described authors’ education – whether in Iran or abroad. These descriptions were immensely helpful when writing about Iranian men’s approaches to Europe and to their own practices of westernization, which often resulted from studies abroad. I could read, for example, about the challenges western dress and appearance posed to someone like Isa Sadiq, who had to forgo his daily shaving upon returning to Iran (since, as he was told by Ministry of Education officials, a bearded teacher is respected more in Iran), but managed to keep his westernized apparel. Another type of source used was photographs. Analyzed carefully, the collections of photographic materials have enabled me to learn not only about male practices of dress and appearance, but also about how the photographed subjects wished to present their bodies, families and occupations. One of the most beautiful examples I’ve encountered included several photographs taken by Qajar aristocrat Ali Khan Vali Qajar, and found in his album. In these photos from the late 19th century, we can see grown men who had their portraits taken alongside their boy lovers, in these cases, two dancers called Hosein Bala and Teymur. The couples are photographed holding hands, looking at each other and at the camera, sometimes alone and sometimes alongside other grown men. The fact that these honorable men chose to have their portraits taken with the dancers shows the legitimacy and even respectability such relationships enjoyed. It also takes boy-loving out of the realm of orientalist slander or poetic phantasy and places it within a concrete historical context. Reading for masculinity in historical sources is often reading subtext rather than text. 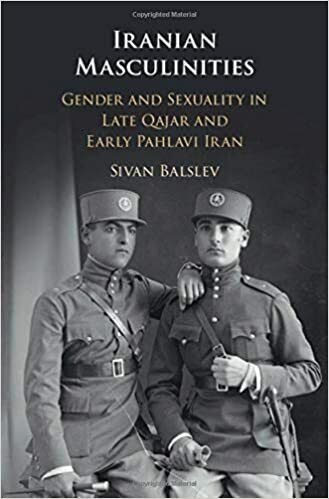 My book wishes to weave these various subtexts into a coherent narrative, bringing Iranian man as gendered subjects under the historian’s lens. About the Author: Dr Sivan Balslev is Lecturer in Islamic and Middle Eastern Studies at the Hebrew University of Jerusalem. She is interested in the social, cultural, and gender history of modern Iran and has published two Hebrew translations of poet Forough Farrokhzad’s books, Another Birth and Let Us Believe in the Beginning of the Cold Season.